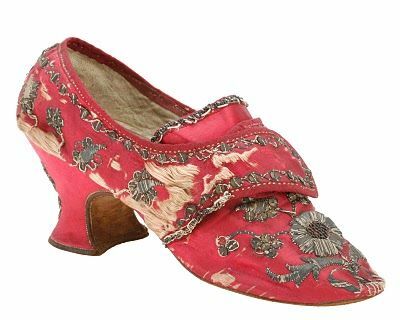 On Facebook, Pamela charged me with finding portraits, fashion plates, and extant examples of red 18th century shoes, and I went a little bonkers and hunted down all sorts of images, so now I shall share them with you, in honor and support of our new red Kensington 18th century shoes currently on pre-order at the shop. This scarce pair of 18th century child’s shoes incorporates the pointed toe and tongue found in fashionable women's styles, combined with the flat heel suitable for a child. It is not clear from the cut whether these shoes would have been worn by a boy or a girl, but the bright color is more suggestive of feminine dress. This great image shows red shoes with yellow heels, and blue shoes with red heels. Colonial Williamsburg did a great recreation of this. Moroccan leather is very fine, high quality goatskin leather that was used for high quality items such as shoes, gloves, book bindings, and furniture coverings. It was traditionally dyed red using sumac, and was tanned in a particular way to bring out the grain. Originally imported from Morocco (of course), it had its imitators, "French Morocco," for instance, made from sheepskin. We're also imitating it with our red Kensingtons, made from high quality pig leather, but dyed the same rich red. Red leather shoes were worn by the middling and upper classes, and were just as "glitzy" as the silk shoes, but more practical. Later in the 18th century, the pastime of walking in the country became popular, and silk shoes just didn't work for such excursions. This lead to a demand for leather shoes, but in any color except black. Black leather shoes were worn by the lower, working classes, and the very poor, and for an aristocratic lady to wear black leather, well, it just wouldn't have happened. Red, yellow, pink, and green leathers were popular, and remember, these were not rough, coarse, bovine leathers, but very high quality goat and sheep leathers, like Moroccan leather. 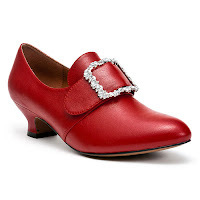 How to wear red 18th century shoes? Some of you ladies are Red Shoe Women and you'll wear your red Kensies with abandon, but some of you may be wondering how to pair red shoes with your 18th century ensembles, especially if your outfit doesn't have any red in it. Don't be afraid! Add a dash of red to your hat, pin on a red ribbon to your stomacher, or tie a red sash at your waist. Any bit of red elsewhere on your person will tie your red shoes in with your ensemble. You can do this with an outfit of any color scheme, even blue, and especially pale blue. Try it! So now you know the inspiration behind the red Kensingtons. Remember to enter the giveaway to win a pair of Kensies, your choice of black or red, and a DVD set of the 18th century film series "Courage, New Hampshire." You can also pre-order your red or black Kensingtons for the special $99 price, between now and March 19, at american-duchess.com. I have always had a love affair with red shoes :) ! When I was in elementary school (the sixties) I would pick out red oxfords if I could find them. My father did not mind as long as they could be polished and shined. Red shoes are a real pick me up, just like a red lipstick. Now you leave me wondering about Moroccan and other leather, because I remembered a Czech children's book (set in indefinite history, but a story about a train suggests 19th century, although the illustrations suggest 18th) - a book about a shoemaker/cobbler turned Robin Hood-kind of robber; all that preface because the book mentions "Kordofan leather". Kordofan, I learn, is in Sudan, but would it be possible that it is just the Czech name for Moroccan leather? Not that you'd know, I just found it interesting. 'Kordofan' sounds like a version of 'Cordovan' which is a type of fine leather associated with Spain (Cordoba). The idea that Spanish (Cordovan) leathers were high status survives in various folk songs where the heroine is often decribed as having shoes of Spanish leather- see 'Black Jack Davy'. It is made from horse hide and is typically a rosey brown color. Seamstrix, thank you! this makes much more sense now.